Hypericin is a naphthodianthrone, an anthraquinone derivative which, together with hyperforin, is one of the principal active constituents of Hypericum (Saint John’s wort). Hypericin is believed to act as an antibiotic, antiviral and non-specific kinaseinhibitor. Hypericin may inhibit the action of the enzyme dopamine β-hydroxylase, leading to increased dopamine levels, although thus possibly decreasing norepinephrine and epinephrine. The large chromophore system in the molecule means that it can cause photosensitivity when ingested beyond threshold amounts. Photosensitivity is often seen in animals that have been allowed to graze on St. John’s Wort. Because hypericin accumulates preferentially in cancerous tissues, it is also used as an indicator of cancerous cells. 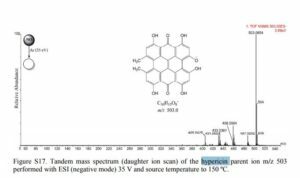 In addition, hypericin is under research as an agent in photodynamic therapy, whereby a biochemical is absorbed by an organism to be later activated with spectrum-specific light from specialized lamps or laser sources, for therapeutic purposes. The antibacterial and antiviral effects of hypericin are also believed to arise from its ability for photo-oxidation of cells and viral particles. ^ Jump up to:a b c d Mehta, Sweety (2012-12-18). “Pharmacognosy of St. John’s Wort”. Pharmaxchange.info. Retrieved 2014-02-16. Jump up^ Oubre, Alondra (1991). “Hypericin: the active ingredient in Saint John’s Wort”. Archived from the original on September 28, 2007. Retrieved September 18, 2006. Jump up^ Loren W. Walker (1999). 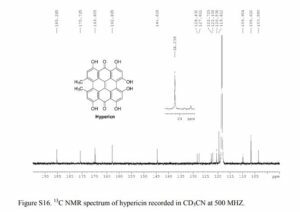 “A Review of the Hypothetical Biogenesis and Regulation of Hypericin synthesis via the Polyketide Pathway in Hypericum perforatum and Experimental Methods Proposed to Evaluate the Hypothesis”. Jump up^ Christian Hertweck (2009). “Polyketide Biosynthesis”. Angew. Chem. Int. Ed. 48: 4688–4716. doi:10.1002/anie.200806121. Jump up^ Murthy, Hosakatte Niranjana et al. “Hypericins: Biotechnological Production from Cell and Organ Cultures.” Applied Microbiology and Biotechnology 98.22 (2014): 9187–9198. PubMed. Web. In this work, an improved synthesis process was developed for the multigram production of hypericin. An inexpensive and efficient low power Light Emission Diode (LED) based photoreactor was designed and employed to perform the protohypericin photocyclization reaction allowing its photoconversion in hypericin. This closed system overcomes safety issues related to scale-up hypericin preparation typically described in the literature which combines the use of open systems, organic solvents, and high-power light sources. The photoreactor designed allows a solution to, mainly, the intrinsic effect of hypericin photobleaching inherent to the protohypericin photocyclization reaction, implying an increase in the yield of the final product and consequently the final cost. 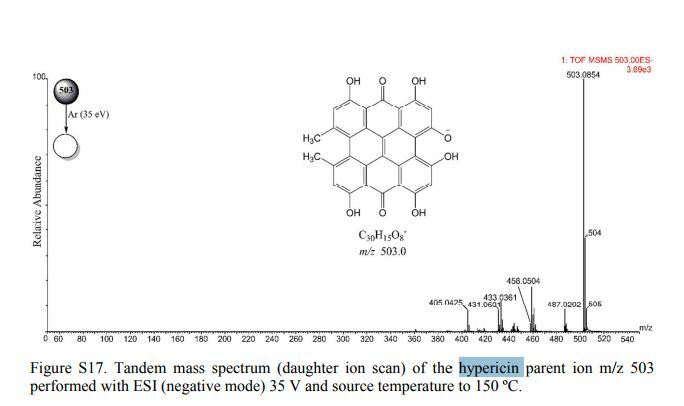 Using a red-LED based photoreactor, a safety protocol was carried out in a 5-g scale hypericin preparation with quantitative yield. 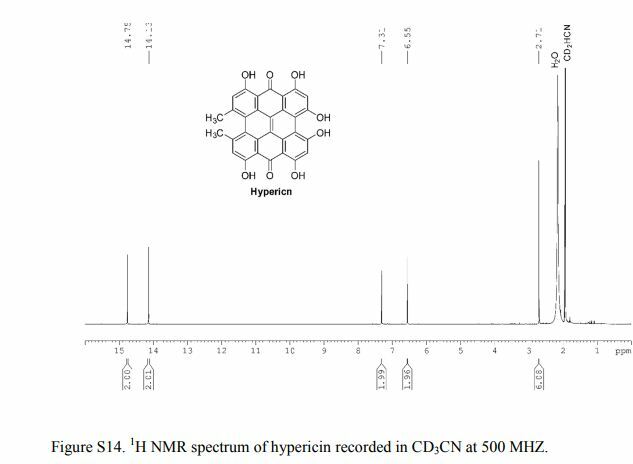 1H NMR (CD3CN, 25 °C, 500 MHz): δH 14.75 (s, 2H, OH-1, OH-6), 14.13 (s, 2H, OH-7, OH-12), 7.31 (s, 2H, Ar-H8, Ar-H11), 6.55 (s, 2H, Ar-H2, Ar-H5), 2.71 (s, 6H, Ar-CH3) ppm; UV–vis (EtOH) λmax 392, 480, 513, 552, 596. 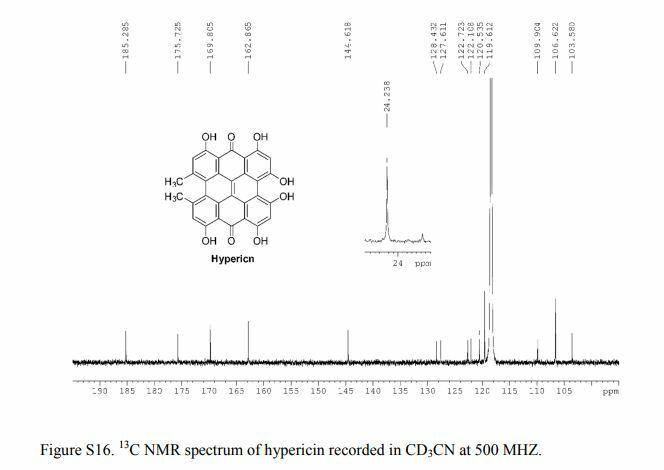 13C NMR (CD3CN, 25 °C, 500 MHz): δC 185.2, 175.7, 169.8, 162.8, 144.6, 128.4, 127.6, 122.7, 122.1, 120.5, 119.6, 109.9, 106.6, 103.5. 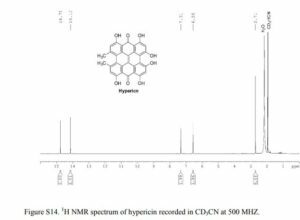 The identification of molecular formula of Hypericin (C30H16O8) was confirmed on its negative HRMS ion of m/z 503.0854 (calcd for [M – H]− 503.0845). The MS2 experiment showed fragment ions characteristic for this compound of m/z 487.0202 [M–H–CH4]−, 458.0504 [M–H–CO2–H·]−, 433.0361 [M–H–CH2═C═O–CO]−, 431.0601 [M–H–CO2–CO]−, and 405.0425 [M–H–CH2═C═O–2CO]−.